Motherhood is meant to be a wonderful time in a woman's life but, all too often, it comes filled with shame, guilt and frustration. Mom shaming is a special form of bullying (October is National Bullying Prevention Awareness Month), and you know that it's a serious yet unresolved issue when bully-in-chief Donald Trump can tell a breastfeeding mom, "you're disgusting" and still become the GOP front-runner in the presidential election. Motherhood is meant to be a wonderful time in a woman's life but, all too often, it comes filled with shame, guilt and frustration. Even celebrities such as Chrissy Teigen aren't safe from it, as pointed out by the Scary Mommy blog last week. Shame on you for breastfeeding in public! What do you mean you missed the PTA meeting? I don't think you're holding your baby right! How could you go back to work after baby was born. A date night with your husband while your little one is at home with a sitter? Unthinkable. Really, you don't bathe your children each night. Poor things. Mommy shaming is a big deal. In fact, according to a survey of 227 moms conducted in early October by mobile app mom.life , 80 percent of moms (that's 4 in 5 moms) have been victim of mom shaming. Let that number sit with you a minute. 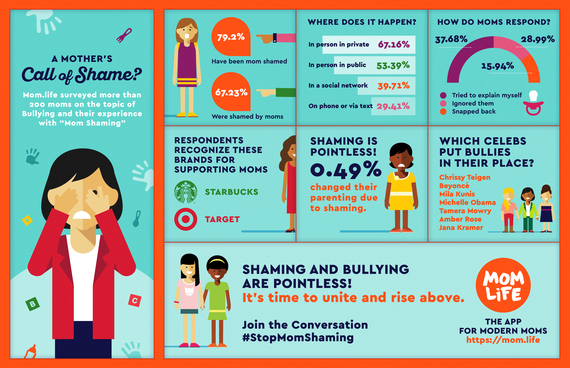 80 percent of moms (that's 4 in 5 moms) have been victim of mom shaming. UNACCEPTABLE. But here is the point. 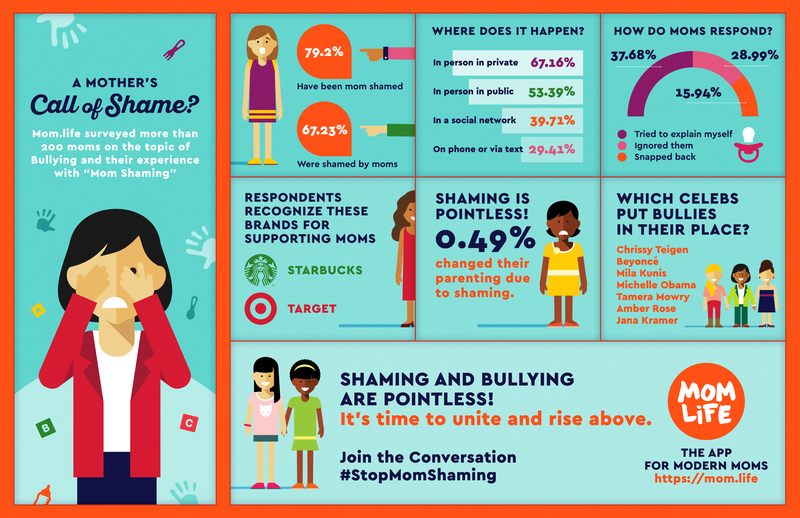 Mommy shaming may make the "shamer" feel righteous and the shamed horrible, but less than 0.5 percent of moms changed their behaviors because of mommy shaming. And how do moms respond? Those numbers are disheartening. Motherhood isn't meant to be full of shame, and yet, the numbers speak for themselves. mom.life is a free mobile app where modern moms meet, chat, support each other and tap the parenting wisdom of the community in a supportive environment that respects and celebrates the authentic and individual parenting decisions that moms make every day.